Access to the Constructionplus database has been withdrawn from Library OneSearch, following a reduction in the amount of freely-accessible content on the site. Posted in Withdrawn resources on January 28 2012 by Resource Discovery and Innovation Team Manager. Following the upgrade of LLR’s subscription to the EBSCOhost database from Academic Search Elite to Academic Search Complete, configurations for the resource have been updated in Library OneSearch and SFX. All Category and Sub-Category assignments from ASE have been recreated and reassigned to ASC; and Academic Search Complete is remote searchable in Library OneSearch. All entries for full-text titles in the Academic Search Elite collection have been withdrawn in SFX; and all full-text titles in Academic Search Complete activated. The additional titles in the ASC collection can immediately be discovered through SFX requests. Individual title level records for these additional full-text journals will be added to the main Library OneSearch index shortly. Posted in Academic Search Complete, Academic Search Elite, EBSCOhost, Library OneSearch on January 25 2012 by Resource Discovery and Innovation Team Manager. At the request of the Academic Liaison Team, a number of revisions have been made to the assignment of databases to Categories and Sub-Categories. New Categories and Sub-Categories have been created; some existing Categories have been split or merged; and a number of databases have been reassigned within the category environment. (A full list of the changes made is available on request). 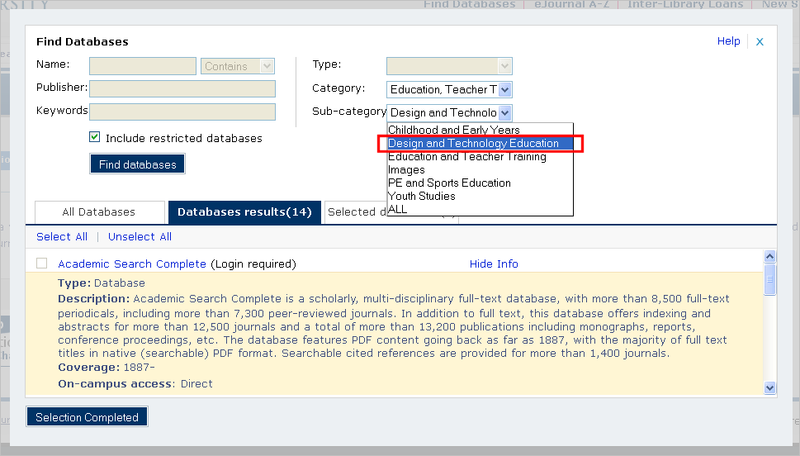 * Categories and Sub-Category assignments can be selected as both browse options and search filters in the Find a Database option in Library OneSearch (see illustration below). * Category and Sub-Category assignments are searchable values in ‘All’ tab searches within Library OneSearch, and appear (as clickable new search options) within the Details display of all database results (see illustration below). The IEEE Xplore database, produced by the Institute of Electrical and Electronics Engineers, has been enabled in Library OneSearch and SFX. Produced by the Institute of Electrical and Electronics Engineers (IEEE) and its publishing partners, this database delivers full text access to the world’s highest quality technical literature in engineering and technology. This database provides web access to almost 3 million full-text documents from some of the world’s most highly cited publications in electrical engineering, computer science and electronics. Content in IEEE Xplore comprises 151 journals, over 900 conference proceedings and more than 3,400 technical standards. NB: no access is available to ebooks or educational courses. Individual title level records for IEEE journals, Conference Proceedings, Conference Series, Standards and other materials has been enabled in SFX. Individual title level journal records will be added to the main Library OneSearch index shortly. Article level and other content from the IEEE collection is already discoverable in ‘All’ searches in Library OneSearch. Posted in IEEE Xplore, SFX on January 25 2012 by Resource Discovery and Innovation Team Manager.